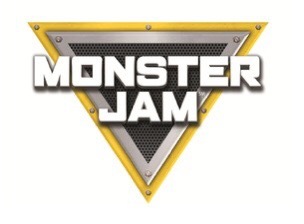 It still blows my mind that I am over-the-moon excited about Feld Entertainment‘s announcement that Monster Jam® is coming to town! Me. Girly girl. Vintage clothes-wearing, theater-going, high-tea-loving me… loves to sit in the stands and whelp it up when those monster trucks roll in. But whelp it up, I do. Monster Jam®, the most adrenaline-charged motorsports experience for families on the planet, will be performing at Camping World Stadium in Orlando on Saturday, January 21, 2017 and tickets are now on sale. Monster Jam events are affordably priced for the whole family with seats starting at $15. 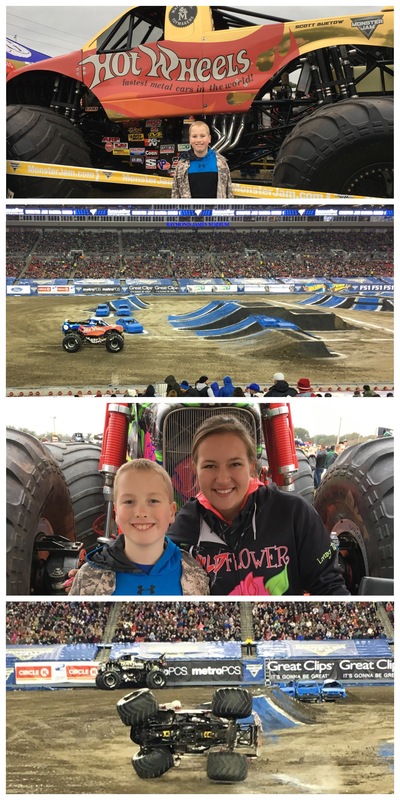 Approximately 12 feet tall and about 12 feet wide, Monster Jam trucks are custom-designed machines that sit atop 66-inch-tall tires and weigh a minimum of 10,000 pounds. Built for short, high-powered bursts of speed, Monster Jam trucks generate 1,500 to 2,000 horsepower and are capable of speeds of up to 100 miles per hour. Monster Jam trucks can fly up to125 to 130 feet (a distance greater than 14 cars side by side) and up to 35 feet in the air. The Party in the Pits on Saturday, January 21, from 2:30 PM – 5:30 PM gives fans the opportunity to get up close and personal to the Monster Jam trucks and drivers. It’s one of our family’s favorite parts, as guests can get up close and personal with their favorite drivers and see just HOW huge these things are! Pit Passes are available for $10.00 at the Amway Center Box office in advance, online at www.ticketmaster.com, or charge by phone at 800-745-3000. Same day event ticket and pit pass required for entry to pit party. Tickets to Monster Jam are now on sale at www.ticketmaster.com. All seats reserved. Subject to facility fee, plus convenience and handling charges. Camping World Stadium is located at 1610 W. Church Street, Orlando, FL 32805. In case you’re wondering who we’re rooting for this season, we’re especially hoping Chad Fortune of Soldier Fortune and Soldier Fortune Black Ops do well. We appreciate how their trucks pay tribute to the men and women who serve in our armed forces (though neither will be in Orlando). Two of our favorites that will be at the Camping World Stadium: Team Hot Wheels driven by Scott Bueto (What 9-year-old doesn’t cheer for Hot Wheels?!) and Madusa! If you’ve never given this giant-tired, loud-noise-generating, cheer-inducing event a try, make this the year you buy tickets. It’s tons (and I mean that literally) of family fun! Talk about exciting! 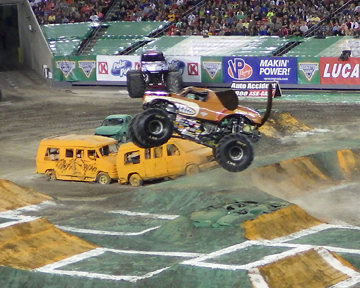 Max-D jumped over three Monster Trucks! Monster Jam will be in Orlando at the Citrus Bowl this week with free truck viewings in and around Central Florida on Thursday, January 21 (more details below). 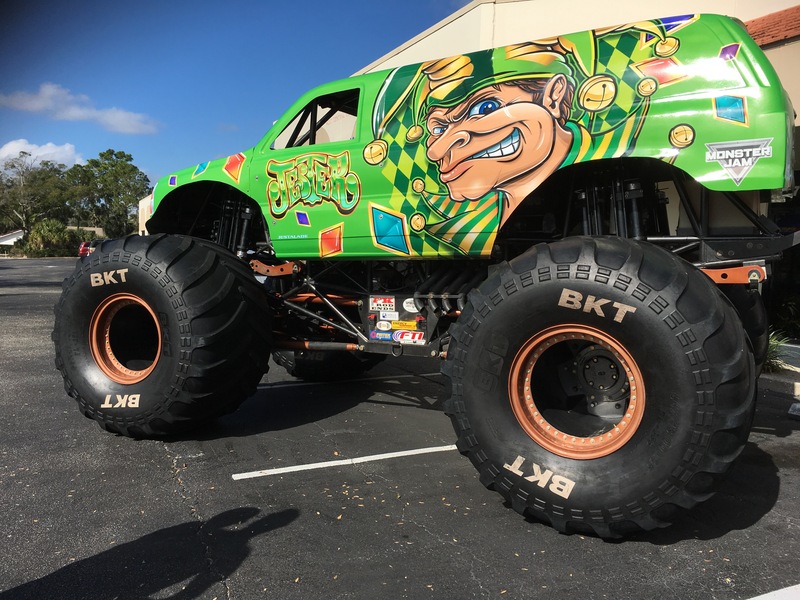 See and take pictures with the enormous trucks and meet the drivers before the beasts roar in to the Orlando Citrus Bowl Stadium on Saturday, January 23 for the Metro PCS, Budweiser, Circle K, & Your Southern Ford Dealers present MONSTER JAM® brought to you by BKT Tires! 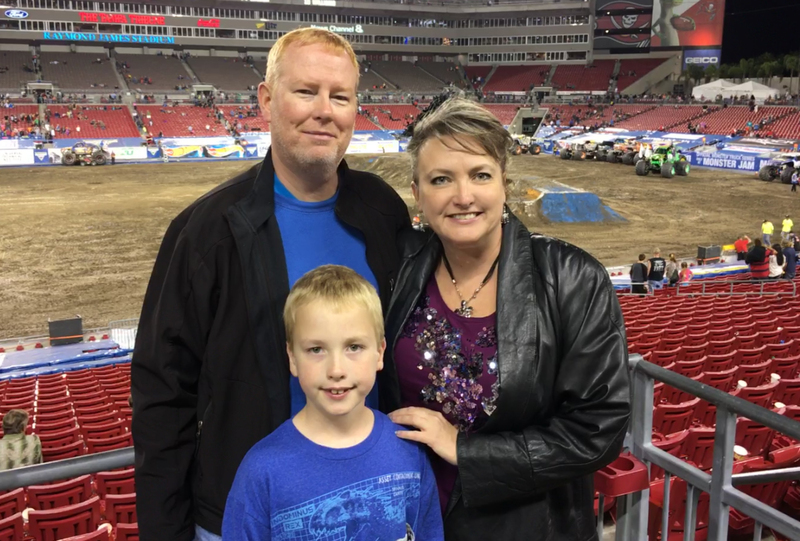 We had an absolute blast last weekend at Monster Jam at Raymond James Stadium as guests of Feld Entertainment. If anyone had ever said I’d be a “Monster Jam mom” a few years ago, I wouldn’t have believed them. YES, my 8-year-old and his dad have a blast, but each year I find myself as loud as everyone else in the stands. It really is a load of fun. 1. It’s LOUD. If you’re bringing children, or you’re sensitive to sound bring ear plugs or protective ear-wear (like these Monster Jam Tire Ear Muffs that are adorbs!). I wear them and I can still hear some of the roar, LOL. 2. It’s fun before the event, too. Party in the Pits is a pre-event event in and of itself! Meet the drivers, watch cool moto tricks, get autographs, visit vendors and more. You can get a FREE pit pass at participating Southern Ford Dealers while supplies last. Pit passes are also available for $10 at the Orlando Citrus Bowl box office day of show, or in advance online at ticektmaster.com or charge by phone at 800-745-3000. Same Day event ticket along with pit pass required for entry. 3. The trucks are HUGE! With 66-inch-tall tires and weighing a minimum of 10,000 pounds, Monster Jam stars trucks called “MONSTERS” for a reason! Be sure to take photos of you and your little ones completely dwarfed by the sheer size of these beasts. 4. The excitement is palpable. From the doughnut competition, to the time trials to the freestyle competition, you can feel the energy in the air. With 1,500 to 2,000 horsepower in those trucks and speeds of up to 100 miles per hour, no wonder there’s a charge in the air! Have fun with your kids before the event with this fun activity pack (click the image). My son loves doing mazes, and there are crafts, and a recipe, too. Advance purchase SuperValue Tickets are ONLY $15. $125 Total Access Pass / $45 Platinum / $35 Gold Sideline / $25 Corners.Tickets are now on sale at www.ticketmaster.com. All seats reserved. Subject to facility fee, plus convenience and handling charges. Don’t wait – buy tickets in advance as prices go up $5 more the week of show (Jan. 18-23). Get more show information at www.MonsterJam.com (click on “Tickets” and search for Orlando January 23). The Orlando Citrus Bowl Stadium is located at 1610 W. Church Street, Orlando, FL 32805. For more information on the Monster Jam, log onto www.MonsterJam.com. To follow Monster Jam on Facebook at Twitter, log on to Facebook.com/MJOnline and Twitter.com/MonsterJam. for posting information about the Orlando show. 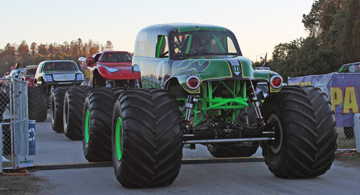 Heart-pounding excitement awaits you at Monster Jam® at the Orlando Citrus Bowl Stadium for a show at 7 p.m. this Saturday, January 24, 2015. Drivers compete in a timed qualifying round, the obstacle course, and the ever-wild freestyle event. I’m not going to lie. I’m a “girly” girl. I like to get gussied up to go to the Orlando Philharmonic and could spend hours watching the dolphins swim gently by at SeaWorld. 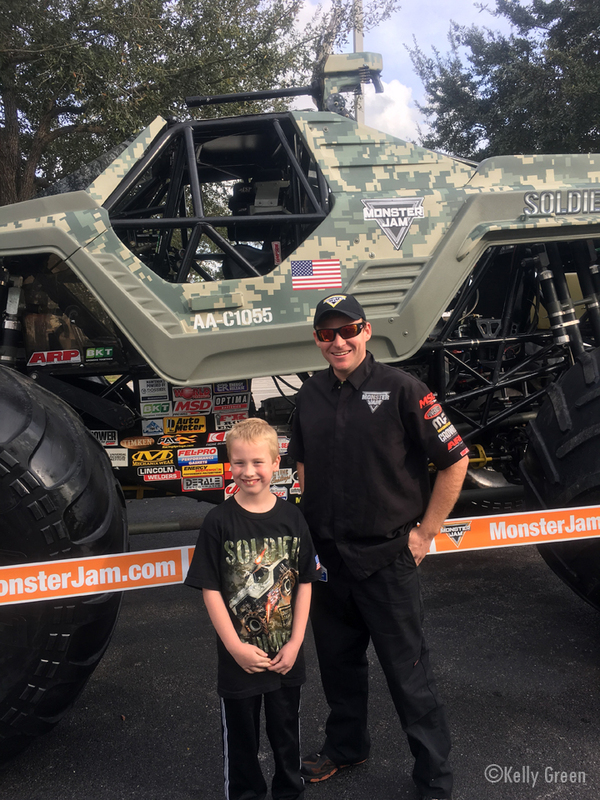 With the exception of attending a Magic game, or when my son is too far ahead of me on his bike, you’ll be hard-pressed to ever find me screaming at the top of my lungs…until you get me at a Monster Jam event, that is! Then “the voice” kicks in, and I don’t mean my singing pipes! The first round is where drivers vie for the quickest qualifying time. Monster Jam events happen concurrently around the country, so there are drivers aiming for the shortest times and those all-important points. It’s kind of like compulsory figures in ice skating, that athletes have to do well to be in good standing. (Showing my “usual” interest and my *cough* age.) 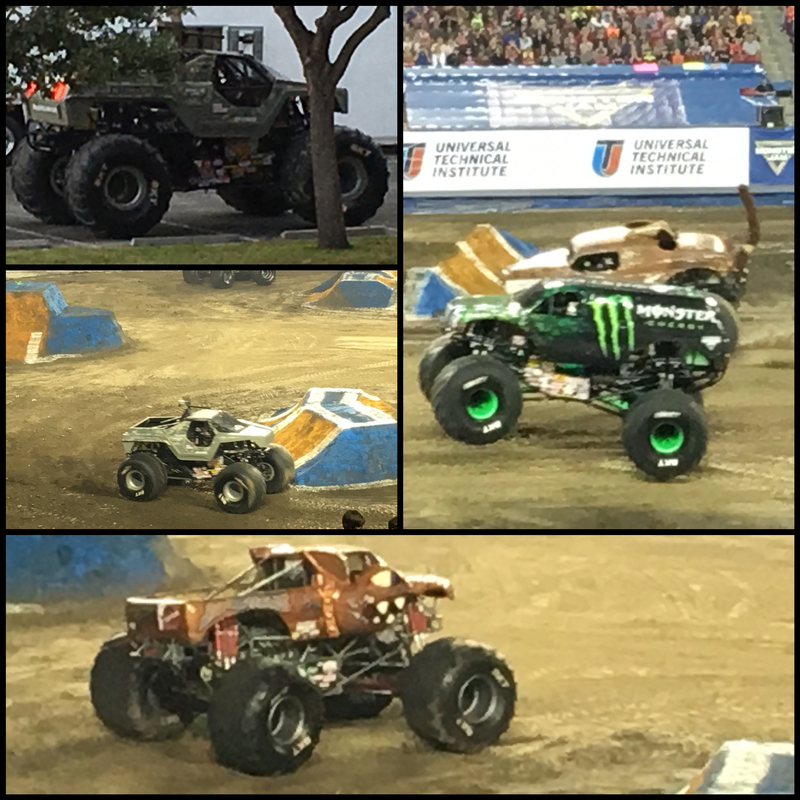 In the Tampa Monster Jam event we attended, Monster Energy “skated” through the course in 25.173 seconds with El Toro Loco “gliding” in at 25.492. In between the events, young ATV drivers show their stuff as they race around the track. Color me impressed with the skill and determination of the young racers! Monster Jam Obstacle Course was next where Monster Mutt won with Hooked right on his heels. In Freestyle, however, I did my most shouting. Some of it was willing the behemoth vehicles NOT to flip over (and if they did, to flip BACK to their wheels-on-the-ground position). 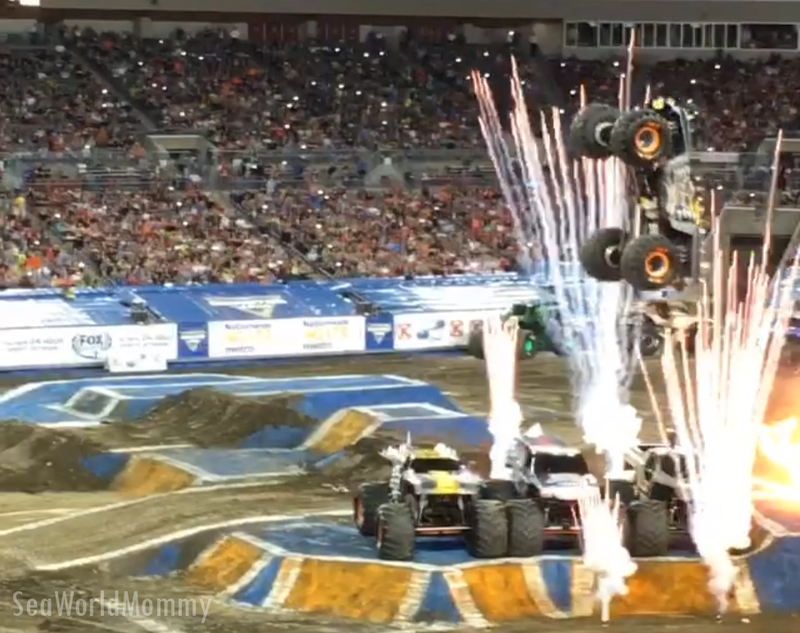 At other times, it was “at” the judges (who did not—IMHO— give Madusa and Monster Mutt their due after being the only two drivers to attempt the huge ramp backflips). Suffice it to say, if you “think” Monster Jam isn’t your thing, give it a try. If you have kids who love racing excitement (and Hot Wheels! )… take them. And if you have a husband or partner who wants some loud racing, truck flipping, dirt flying excitement…. Well, you get the picture! Overkill Evolution driven by Mike Vaters Jr.
Tickets start at $15 and are on sale now at all Ticketmaster outlets, the Citrus Bowl Stadium Box Office, charge by phone at 800-745-3000, or online at www.ticketmaster.com. For more information visit www.monsterjam.com. Before the event is the ever-popular Party In The Pits. The Pit Party is a HUGE attraction for kids and families. 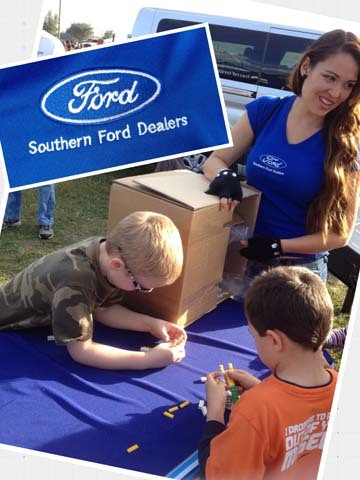 You can score FREE Pit Passes at your Orlando area Southern Ford Dealers from 12/29/14 – 1/24/15! While supplies last. Pit Passes are also available at the Orlando Citrus Bowl Box Office, online at http://www.ticketmaster.com or Charge by Phone at 800-745-3000. Saturday, January 24 – 7:00 PM event ticket along with Pit Pass required for entry. Can’t wait until the weekend? Four of the Orlando show’s biggest stars will be on display in this week. Take pictures with the enormous trucks and meet the drivers, before the show in the newly renovated Orlando Citrus Bowl Stadium on Saturday, January 24. Best part, it’s free to the public. Overkill Evolution | Thursday, Jan. 22 | 3-7 p.m. Son Uva Digger | Thursday, Jan. 22 | 3-7 p.m.
Max D | Thursday, Jan. 22 | 3-7 p.m. Grave Digger Legend | Friday, Jan. 23 | 10 a.m. – 2 p.m.
A crew of eight works 18-20 hours a day for three straight days to construct a monster truck course! For the Orlando show, work begins tomorrow morning at 11 a.m.
thick, and weighs 130 pounds. The work team uses a carpet-pulling device to make a tight seal above the turf. Stadium officials and architects consulted Monster Jam in the development of the $3 million+ Orlando Citrus Bowl’s all-new South End tunnel, which provides Monster Jam with easier access in and out of the stadium. Each year 700,000 cubic yards of dirt are used to put on Monster Jam events. The Orlando Citrus Bowl track is approximately 230’ wide by 360’ long. Once the event ends, the dirt move-out process starts immediately. All dirt and field protection product is generally completely removed within 20 hours after the Monster Jam event concludes. Tampa Monster Jam show in exchange for this honest review. Monster Jam Coming to Orlando Next! 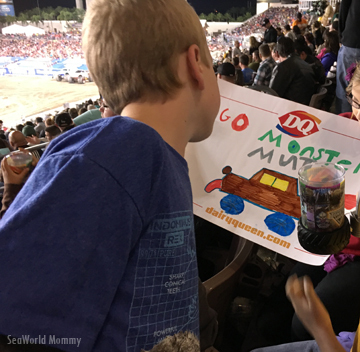 This past weekend our family went on an exciting adventure: Our first Monster Jam® event. We received complimentary tickets courtesy of Feld Motor Sports in exchange for an honest review. It was my husband’s birthday, and both he and my son were “beyond” thrilled that THIS would be how we’d celebrate. Having never even seen even a Monster Jam video prior, I was a little less excited. I should have been! 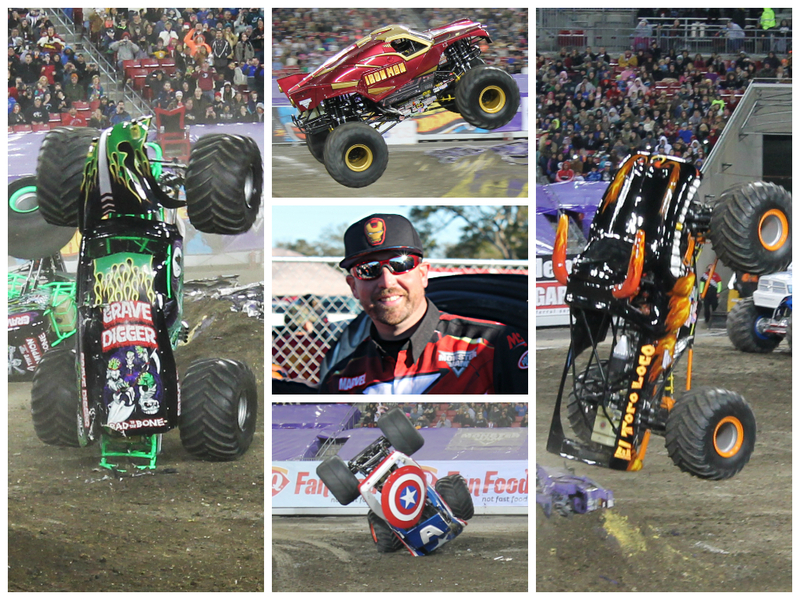 On left: Two Grave Digger trucks wowed the crowd with a little off-book freestyle-a-deux; In center: Iron Man flies through the air; Iron Man driver Dustin Brown; Captain America mid flip; Far right: Marc McDonald and El Toro Loco doing a “head” stand. 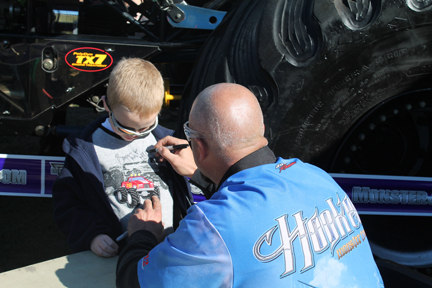 Hooked driver Bryan Wright signs his autograph on my kiddo’s shirt. Before the main event, we got to meet and greet lots of drivers and see the trucks up close at the “Party in the Pits” (a separate event with tickets distributed at area sponsors or on race day, if available, for a fee). I knew the trucks would be huge, but seeing my child (who’s tall for his age) come up “short” next to just the tires was quite amazing. The festival-like atmosphere was great fun and tons of families waited in lines to either get autographs, experience truck rides or bounce in a bounce house (the kids, not the grownups!). We caught the parade of trucks as they rumbled past us into the stadium. My son grinned from ear to ear as he reported how his chest “felt” them go by. After the Monster Jam Party in the Pits we went into the stadium. The excitement was palpable, and fans eagerly awaited the racing and freestyle. The BEST part was the freestyle. I kid you not, I was holding my hand over my mouth at half the stunts, a worried look in my eyes. (Hey, I put the “mommy” in SeaWorld Mommy and I thought for sure someone was going to get hurt!) Amazingly, though, all drivers triumphantly exited their bashed in, banged up, and crushed down trucks. Can you believe THIS guy driving the Phantom truck remained unscathed. 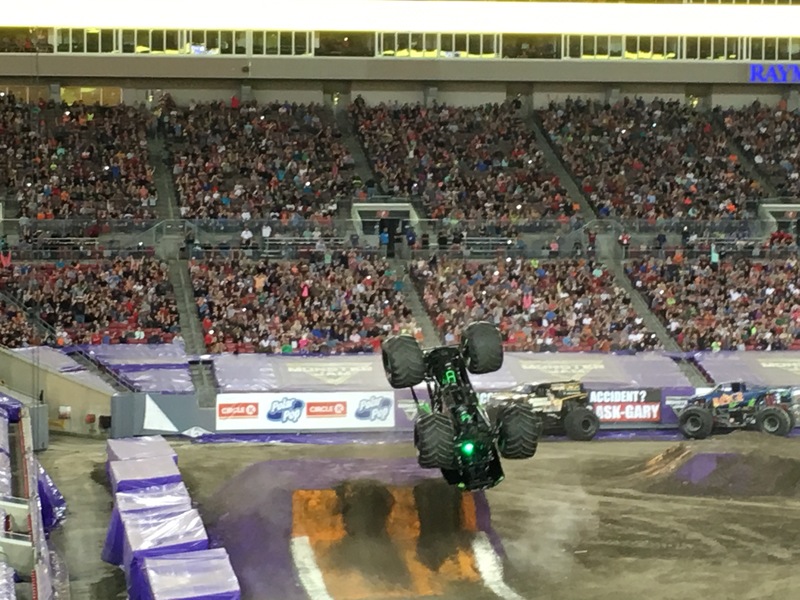 The Phantom FLIPS at Monster Jam! Photos courtesy SeaWorld Daddy! at 800-745-3000 or ticketmaster.com. Tickets will also be available day of show at the Citrus Bowl. All seats reserved. Subject to facility fee, plus convenience and handling charges. Don’t wait – buy tickets in advance as prices go up $5 more the week of show. Get more show information at http://www.MonsterJam.com (click on “Tickets” and search for Orlando January 25th). Many of the trucks appearing in Monster Jam will be on display around Central Florida on Friday, January 24th, free and open to the public. Mohawk Warrior will be on display from 10 am to 2 pm at Universal Technical Institute, 2202 West Taft-Vineland Road, Orlando, 32837. See War Wizard from 3 pm to 7 pm at Kangaroo Express, 17503 W State Road 50, Oakland, 34787. Monster Mutt Rottweiler will visit Metro PCS, 1453 Sand Lake Road, Orlando, 32809 from 3 pm to 7 pm. 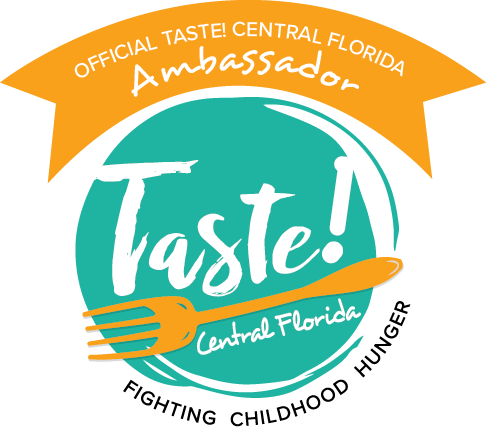 And Stone Crusher will be at Tropical Ford, 9900 South Orange Blossom Trail, Orlando, 32837 from 3 pm -7 pm. My boys are already talking about making Monster Jam a yearly pilgrimage. Although usually a “girly girl,” I, too, have caught the monster truck bug and can’t wait to see another show. From the Party in the Pits fun and all through to the last crushed vehicle, we had a roaring good time!